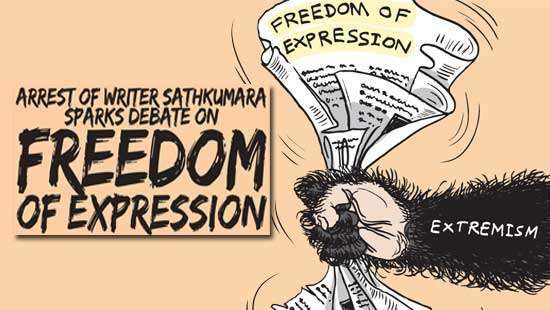 Daily Mirror - Let’s Get Real about Sri Lanka’s Urbanization! Some purists might disagree, but it is universally agreed that urban areas -- cities and towns of various size and shape -- offer better facilities and opportunities for their residents. So how urbanized Sri Lanka is? Many among us keep repeating a notion that ‘we are predominantly rural’, but is it really so? 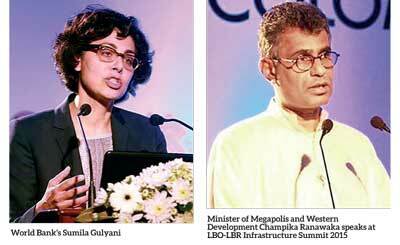 At the recent LBR/LBO Infrastructure Summit 2015 held in Colombo in early November, Minister of Megapolis and Western Development Champika Ranawaka took on this myth head on. He argued that Sri Lanka’s urban population share is probably as high as 48% -- which is two and a half times higher than the current figure. The Bank’s own estimates are roughly the same, she said. “The official statistics of urban population in Sri Lanka is from 14% to 18% -- but if you look at the agglomeration, it is (actually) around 47%”. The report (available at http://hdl.handle.net/10986/22549) suggests that as much as one-thirds of Sri Lanka’s population may be living in areas that, while not officially classified as urban, “nevertheless possess strong urban characteristics”. This report tries to overcome our region’s data deficiencies by drawing on some unconventional data sources -- such as night-time lights and other forms of remotely sensed earth observation data. Analysis of night lights have also revealed a more general growth of multi-city agglomerations -- continuously lit belts of urbanization containing two or more sizeable cities -- across South Asia. Their number has risen from 37 in 1999 to 45 in 2010. 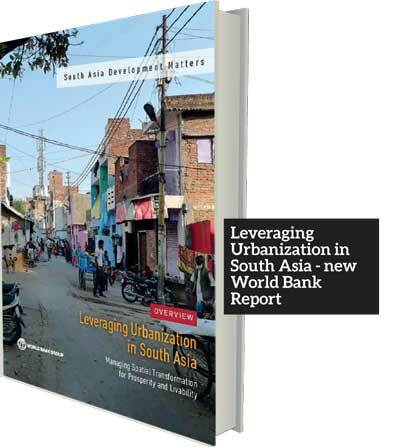 A general conclusion of the report is that South Asian countries’ urgent need to increase higher quality and more comprehensive data on urban trends and conditions. In Sri Lanka, the low figure for urban population is the direct result of an administrative decision to count all Pradeshiya Sabha areas as being rural. 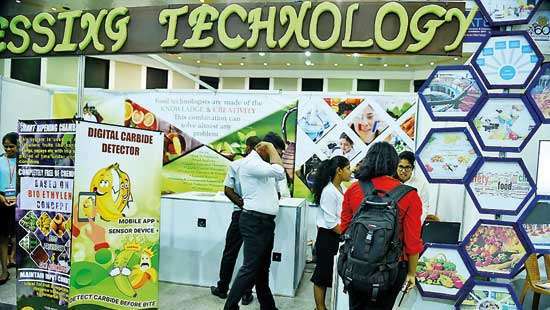 This has long been critiqued by experts such as town planner Prof. Ashley L. S. Perera of the University of Moratuwa. When the new local government unit was created in 1987 for political expediency, their demarcations totally ignored the existing ground realities, he says. 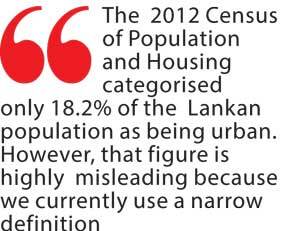 That has led to much confusion about ‘urban areas’ in Sri Lanka for the past quarter century . After 1987, some towns lost their urban status and overnight became ‘officially rural’. The Department acknowledges that there are many areas outside MCs and UCs that “have urban outlook but still classified as rural”. This leads to underestimation of the degree of urban­ization and comparison becomes difficult over the years, it says. At the time of the 2012 Census, Sri Lanka had a total of 23 MCs and 41 UCs. According to the Census findings, the country’s eight largest cities -- Colombo, Kaduwela, Dehiwala-Mt. Lavinia, Moratuwa, Negombo, Kotte, Kesbewa and Maharagama -- made up nearly half (48%) of what is officially considered the ‘urban’ population. All these are located in the Western Province. For example, World Urbanization Prospects 2014, a global overview published by the UN Department of Economic and Social Affairs, has listed Sri Lanka as one of 16 countries worldwide that “still have low levels of urbanization; i.e. below 20 per cent”. (As an inter-governmental body, the UN goes by national governmental data). The largest (by population) among these ‘low urbanized countries’, were listed as Burundi, Ethiopia, Malawi, Niger, South Sudan, Uganda, Nepal and Sri Lanka. “By 2050, all of these countries are expected to become significantly more urbanized, with as much as twice their respective proportions urban in 2014,” the UN report noted (see full text at: http://esa.un.org/unpd/wup/Highlights/WUP2014-Highlights.pdf). 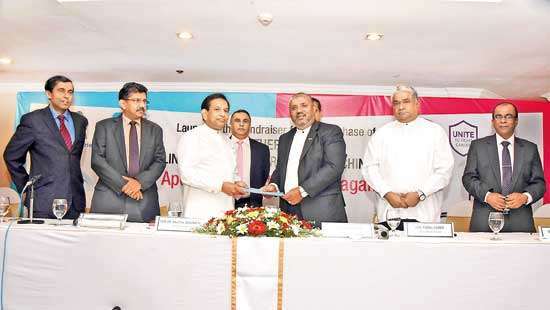 However, as Minister Ranawaka just publicly declared, that doubling has already happened in Sri Lanka! Now if only official data custodians can change definitions, we can finally move away from the illusion of being a rural country.